Green pineapple case compatible with Apple iPhone 7 / iPhone 8. Do not Fit Any other models, Without Screen Protector. 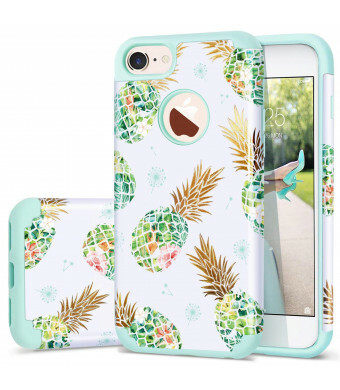 2 in1 Design: Plastic Pineapple cover+green inner silicone protect your iPhone 8 / 7 from Drop and Scratch Protection. 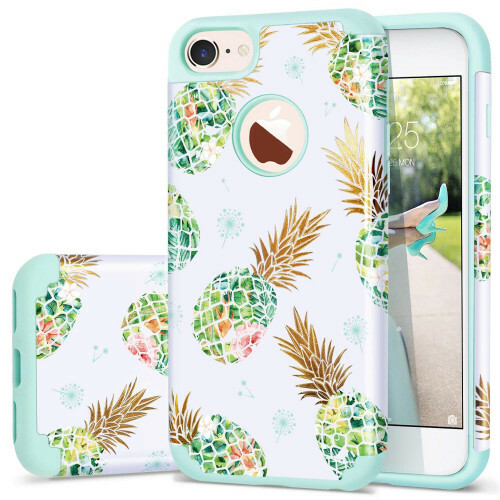 iPhone 7/8 Pineapple Case,summer fresh design,popular elements,foral colorful pineapple&dandelion pattern,makes your 7/8 different and stylish. Slim fit lightweight phone case,iPhone 7 case for girls,iPhone 8 case for women,raised bevel lip on front of case can help protect your phone screen against scratches. 1.Accessories ONLY, Phone and Screen Protector are not included. 1.2 in 1 layer:Hard plastic cover and soft silicone interior. 2.Soft Side Grip:Covered by soft rubber to great touch feeling. 3.Great Protection: Dual layer support good protection to your phone. 4.Larger Cut-outs and Opennings for Compatibility with Large Headphone Jack and Ports. 5.Modern Design: the Colorful Pineapple&Free dandelion printed on the hard cover is permanent. 7.Easy to install, great to protect. 1.Is it fit for iphone 8 plus? 2.Does it have screen protector?